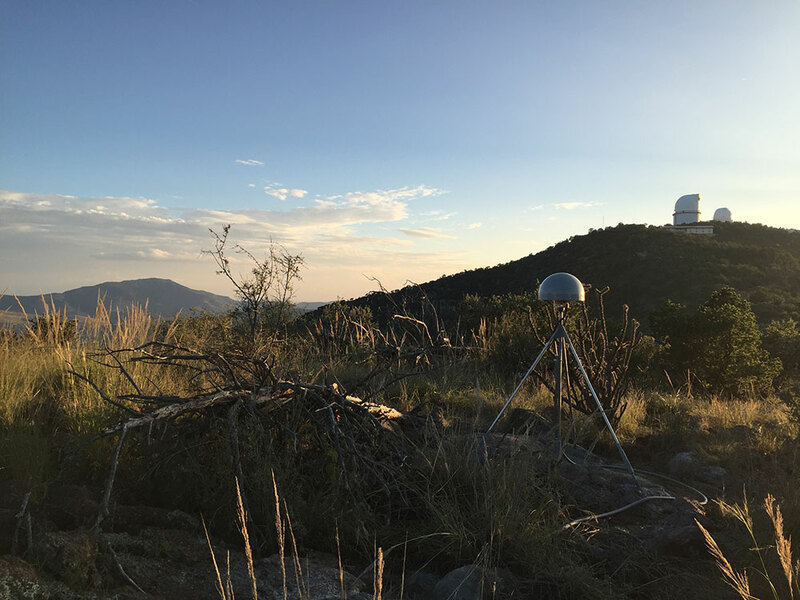 NASA’s Space Geodesy Project (SGP) was initiated in order to develop and maintain a global network of next-generation space geodetic observing instruments. Core sites around the globe will use three or four of the primary space-geodetic techniques: Very Long Baseline Interferometry (VLBI), Satellite Laser Ranging (SLR), Doppler Orbitography by Radiopositioning Integrated on Satellite (DORIS), and the Global Navigation Satellite System (GNSS). Deployments of these instruments with next-generation measurement capabilities have been underway since 2011. UNAVCO’s contribution to the SGP involves engineering support for the construction of GNSS infrastructure at selected core sites. 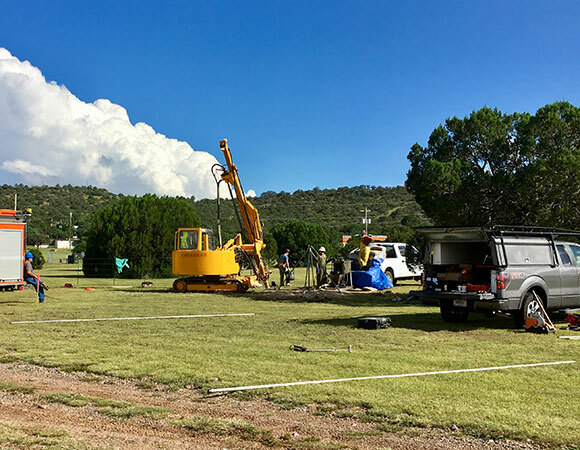 In September 2017, UNAVCO completed the installation of four new deep drilled braced GNSS monuments (DDBM) and one short drilled braced GNSS monument (SDBM) at the McDonald Observatory near Fort Davis, Texas. 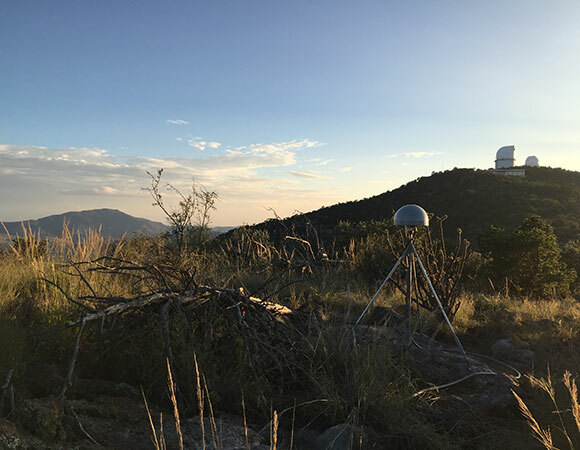 The installations at McDonald Observatory marked the last phase of UNAVCO fieldwork for the SGP. UNAVCO had previously completed the permitting and installation of additional GNSS infrastructure at the SGP core site split between the Hawaiian Islands of Maui and Kauai. The SGP will rely on the GNSS at each core site to provide baseline vector ties between the different instruments of each space-geodetic technique. The SGP is NASA’s contribution to the Global Geodetic Observing System, and arose as a response to new requirements for maintaining a high-precision International Terrestrial Reference Frame (ITRF). The ITRF is determined by the geodetic observations made from VLBI, SLR, GNSS, and DORIS instruments, and is the foundation for virtually all other Earth observations and georeferenced data used by society. It is fundamental for spacecraft tracking, navigation, and the understanding of global, regional, and local changes in the earth. The next-generation geodetic infrastructure provided by the SGP will be critical to realizing the full potential of existing and future spacecraft dedicated to earth observations. 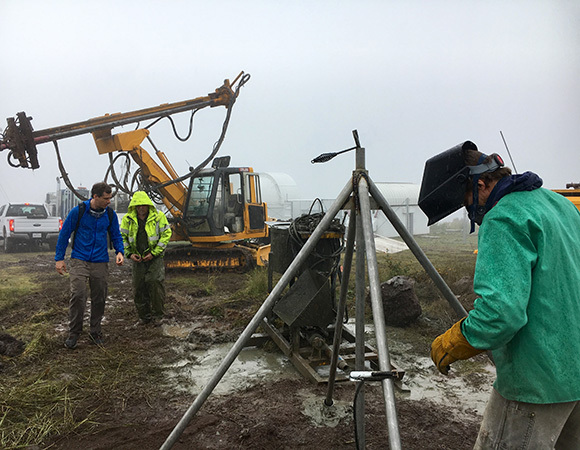 Numerous scientific disciplines depend on the measurements made from these instruments and include areas of study such as changing sea levels, earthquake early warning systems, volcano deformation, flooding patterns, and glacier dynamics. The five GNSS monuments were installed in three main areas around the observatory. The locations account for proximity to the future VLBI and SLR instruments, which, due to site suitability constraints, will be installed in two different locations on the grounds. Additionally, the GNSS monuments were positioned for line of sight between each other, as well as the VLBI and SLR. Three DDBMs (station codes MGO4, MGO5, and RTS2) were installed in a large field near the observatory's Frank N. Bash Visitors Center, in a triangle formation around the future location of the VLBI. An operations building will be installed in 2018 for the VLBI and will provide rack space, power, and internet for the GNSS receivers and computer. Two of the three monuments will support permanently operating GNSS antennas, and one of the monuments will be reserved solely for a total station that will be used to survey retro reflectors mounted on each GNSS monument, as well as the VLBI, SLR, and other survey points around the observatory. One DDBM (MGO2) was installed a half mile to the east of the first three monuments, adjacent to the location for the future SLR. This site is atop Mt. Fowlkes, which is ~400 feet higher than the visitors center area. 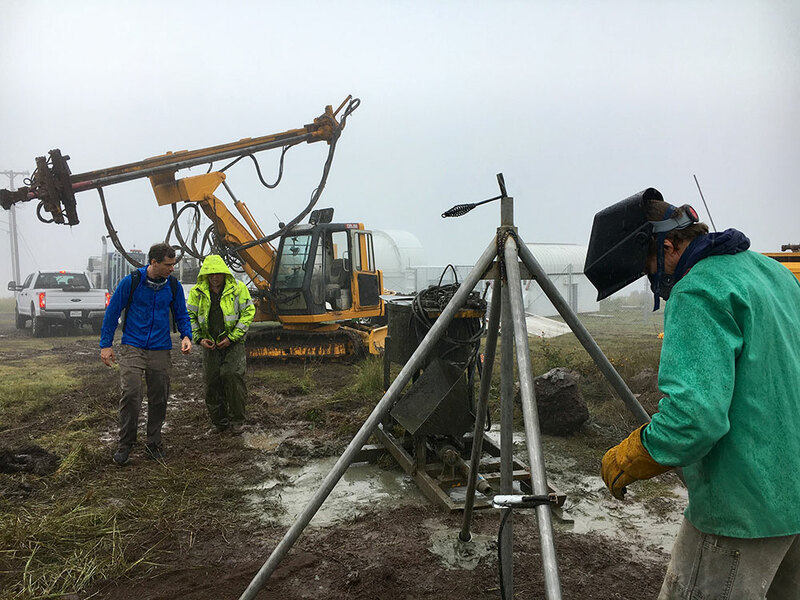 This site is also the location of existing IGS station MDO1 and will have various other instruments co-located with the SLR, including a met station and a gravimeter. The SDBM (MGO3) was installed a quarter mile to the south and downhill from MGO2 at a saddle between Mt. Fowlkes and Mt. Locke. MGO3 is about half a mile to the southeast of the visitors center/VLBI area. Rack space, power, and a network drop are provided in a nearby hangar. UNAVCO used a professional drill contractor for the installation of all four DDBMs, but installed the SDBM without additional support. Station MGO3 was installed atop a rocky outcrop which did not allow access for a large drill rig. 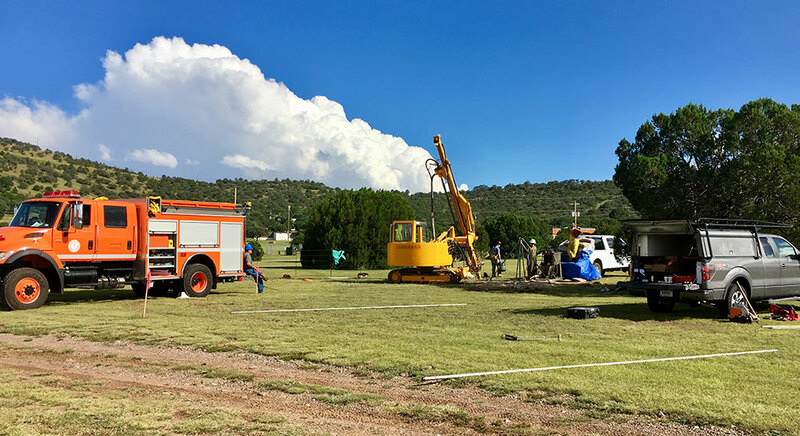 VLBI and SLR infrastructure will be installed at the McDonald Observatory by NASA contractors in 2018.